Greek cuisine is characterized as the Mediterranean, while it also has some common features with the traditional Italian, Balkan, Turkish and Levantine kitchens (Middle East). Greek food and gastronomy is part of Greek history and culture. Shipping, travel, wars, colonies, conquerors, campaigns brought the Greeks into contact with new cultures, new materials and techniques and influenced eating habits. In ancient times, along with trade, spices, sugar, new vegetables cause the Greeks to experiment with new recipes, new ways of cooking and more processed foods. Their diet was complemented by hunting, especially hares (eg hare with coriander and oil sauce). One of the first Cookbook was written by a Greek chef Arhestratus in the 5th century BC and called it "Gastronomy"! Olives, grapes and the wine have been used 3000 years ago. An important parameter in the formation of gastronomy is the soil morphology, varied but barren in many areas of Greek land. Livestock farming is also important with pigs, sheeps, goats and fewer cattle. The oldest known plant in antiquity was the coriander. Ancient Greeks have used the mustard, the fennel, the cumin from seeds found in the excavations and in places that witnessed culinary activities. Well known and common was the sesame, the poppy, wild saffron, ancestor of today’s cultivated saffron. Tuna was the first choice fish as it was always plentiful in the Greek seas. Other popular fish were the marsupials, the bass, the anchovies, sardines, squid, cuttlefish and shrimp. Byzantine cuisine was similar to the ancient Greek cuisine and is the natural physics of it, but with new ingredients that were not available in the past, such as caviar, nutmeg, basil and lemons, while the fish continues to be an integral part of the diet. Byzantine cuisine benefited from Istanbul’s key geographic location, which was a global center of the spice trade. Popular was the aromatized wine with anise, mastic or Retsina wine ancestors of today’s liqueurs. Muscat is cultivated from antiquity to the present days, and even on the same islands of Chios, Lesbos, Limnos and Samos. Their wines have been popular since then in Greece. Innovations come in Byzantine times. Byzantine cuisine was similar to the ancient Greek cuisine, but with new ingredients that were not available in the past, such as caviar, nutmeg, basil and lemon, while the fish continues to be an integral part of the diet. Byzantine cuisine benefited from Istanbul’s key geographic location, which was a global center of the spice trade. The eggplant and the sunflower were the new ingredients too, and it is considered innovative to make vinegar with vine leaves. In the Aegean as well as in the continental Greece experiments began in dairy products and so began the production of cheese and feta cheese. In Byzantium, at the same time, the import of sugar begins. So they start to make sweets and liqueurs such as puddings, rice with honey, spoon sweets, fruit jam (quince or pear). Modern Greek cooking has a wide use of vegetables, olive oil, cereals, fish, wine and meat (white & red). Also, other important products are olives, tomatoes, cheese, aubergines, zucchini, onion, garlic and yogurt. Typical herbs were basil, oregano, mint and thyme that pleasantly flavor the dishes as well as lemon and the olive oil that was found everywhere. 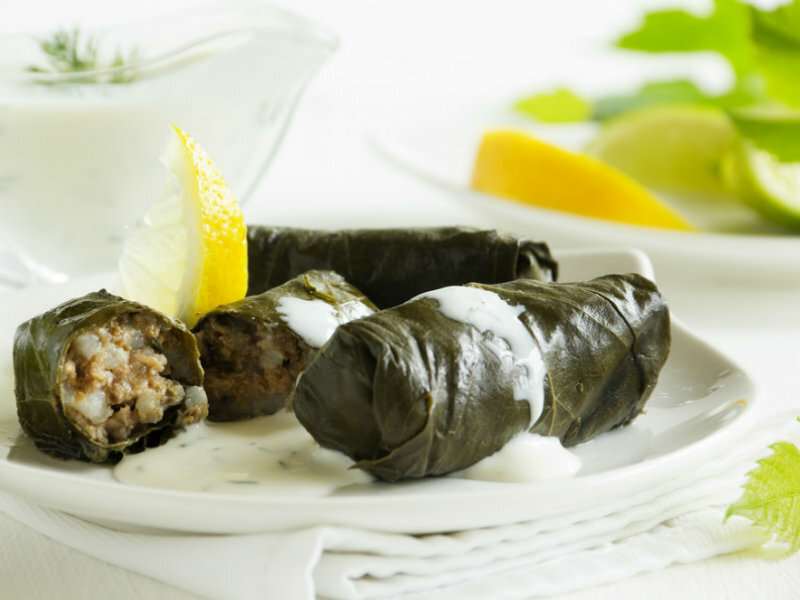 Another important parameter of Greek cuisine is the so-called Mezedes that is a collective name for a variety of small meals, usually served with wine, ouzo or tsipouro in taverns but also served to a visitor who may have someone at his home.